Theo Breuer is a German poet, editor, translator and publisher, who lives in the village of Sistig in the Eifel National Park near the Belgian border. 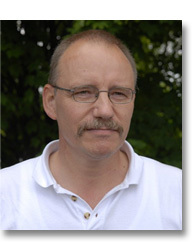 He was born in 1956 in Buervenich/Rhineland and educated at Cologne University. Of his many books of poetry since 1988, the three most recent are: Land Stadt Flucht [Country City Getaway], 2002; Nacht im Kreuz [Night in the Cross], 2006; and Wortlos [Wordless], 2009. In collaboration with poets in Canada, England, Italy, Japan, the USA and other countries, he has published experimental and visual poetry, and he has written a number of monographs exploring the widely-ramifying possibilities of expression and verse-forms since 1989, including: Ohne Punkt & Komma: Lyrik in den 90er Jahren [Without Full Stop & Comma: Poetry in the Nineties], 1999; Aus dem Hinterland: Lyrik nach 2000 [From the Hinterland: Poetry since 2000]; and Kiesel & Kastanie: Von neuen Gedichten und Geschichten [Pebble and Chestnut: New Poems and Prose], 2008. Theo Breuer’s poems have been translated into English, French, Italian, Polish, Romanian and Russian. He has translated two poetry books by Richard Burns (aka Richard Berengarten) into German: Tree (Baum, 1989) and Black Light (Schwarzes Licht, 1996). At his small press, Edition YE, which he founded in 1993, Breuer also publishes the magazine Faltblatt [Flyer], the YE international anthology series (assemblages of original art and handwritten poetry), and a series of contemporary German poets.